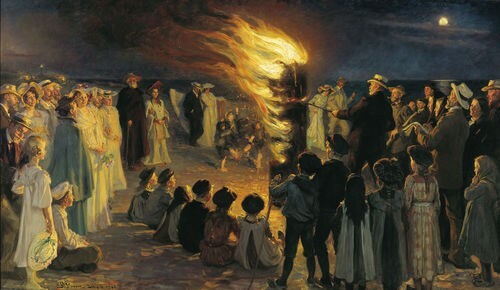 There are several interesting things to discover when looking at the amazing painting St John’s eve Bonfire on Skagen Beach by Skagen painter P.S Krøyer, completed in 1906. One thing the curious eye might spot are the different kinds of light; the light from the moon, the fire and the lighthouse. What a lot of people do not know was that Krøyer throughout his life had a fascination with fire; witnessing an eruption of the volcano Vesuvius had made an impression on him and he drew the streams of lava in a letter to his brother. When the royal palace in Copenhagen went up in flames in 1884 the painter was sorry that he had not been there to see it. In the bonfire painting the three types of light all bring their own elements to the picture. The moon is hiding behind ominous clouds. The lighthouse feels distant. Closest to the fire we find the love of Krøyer’s life, Marie Krøyer, together with her new partner, the Swedish composer Hugo Alfvén. The flames are blowing in their direction. Perhaps a sign of a heart ablaze? The painting can be seen at the Skagens Museum. If you would like to learn more about the lights of beautiful Skagen, have a look at the Northern Lights Book.